And by the end of the day we were all exhausted. Quesadillas, rice, beans from a can. And this salsa. This salsa! It brightened everything right up. Bring home a pound of tomatillos and a lime next time you’re out, and in five minutes you’ll be cheered right up. Have the energy to go beyond quesadillas? I love tomatillo salsa on black bean tacos, taco salads, huevos rancheros, and chilaquiles. Especially chilaquiles. Maybe it’s a good thing that the seasons are changing after all. Fresh Tomatillo Salsa: Remove the husks from a pound of tomatillos, lightly scrub them to wash off the waxy coating, and quarter them. Remove the seeds from a spicy green pepper (a serrano or jalapeno, say, or the one I got in my CSA box) and chop it coarsely; start with half if it’s quite spicy and consider adding the seeds if it’s not very spicy at all. Slice up 2 biggish cloves of garlic. Transfer tomatillos, peppers, and garlic to a food processor along with 3 Tbsp. lime juice and 1 tsp. salt. Pulse a few times, scrape down the sides, then puree until nearly smooth, leaving just a little texture. Taste and adjust the flavors with more lime juice (I used 4 Tbsp. total, but I suggest starting with 3 because your tomatillos may be more tart than mine), more salt, or more spicy pepper. Looks delicious and so easy!! Thanks for the tip. 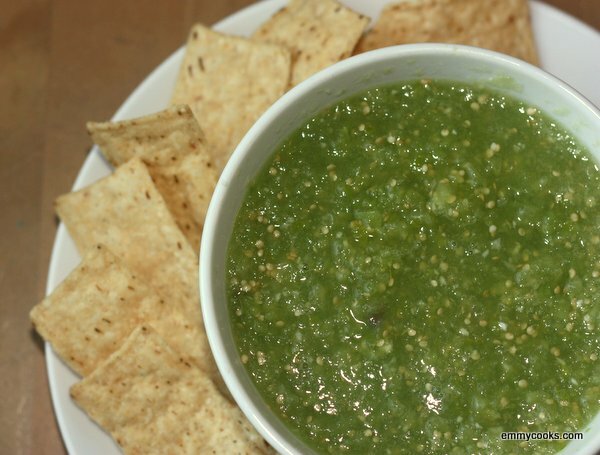 When I made salsa with Tomatillo Salsa would roast the tomatillo. Your recipe sounds delicious and a real time saver. Hi Ronda! I hope you and your family are well! :) I like all kinds of salsa, but this is certainly faster than a roasted/cooked salsa, and the flavor is very bright. At this time of year when the veggies are so good I like to keep it simple. :) Take care! I’m not sure of this will end up in the comments section or your inbox…I’m trying just replying to the Emmy Cooks email. Sounds like you had a terrific last day before school. The salsa looks so beautiful! I haven’t had good luck with tomatillo salsa…seems I always pick bitter ones. I think I’ll try again. Interesting! It popped up in the comments–that’s fun! I wonder if you’d like the tomatillo flavor more if you tried to find ones that were a little softer and moving toward yellow instead of granny-smith-green? Love these little five minute additions to a menu that can totally turn something for Ho-Hum to YUM! I feel like a dunce, I’ve always roasted my tomatillos for salsa. Oops, this looks WAY better! If we do a bigger quantity for the next day, let say… how long can we keep it in the fridge? Look soooo good! Will try to find some tomatillos here.